The latest research report by Zion Market Research (ZMR) states that the global market for smart glasses is demonstrating an extremely competitive business environment with the presence of a number of dominating market players. Gentex Corp., Glass Apps, Raven Brick LLC, Smart Glass International Ltd., Research Frontiers, AGC Ltd, Pleotint LLC, SPD Control System Corporation, SAGE Electrochromics, Scienstry Inc., Hitachi Chemicals Co. Ltd, SAGE Electrochromics, and PPG Industries are some of the dominating market players in the global smart glass market. As estimated in the report by Zion Market Research, the Global smart glass market witnessed a value of over USD 2.1 Billion in 2015. The global smart glass market is expected to touch the value of about USD 6.56 Billion in 2021. As per the report, the smart glass market will mount at a CAGR of a slightly above 19.0% between 2016 and 2021. The blend of potash, silica, and lime at the high temperature is responsible for the formation of a glass. Numerous components can be added to improve the properties of glass. Smart Glass is an innovative building material. It is made up of electrochromic glass. Smart glass is used in the construction of smart partitions, windows, and skylights. Smart glass uses an advanced technology with external stimulus properties. It uses the concept of clean technology. Smart glass can switch its properties according to the outside temperature. It can be controlled either manually or automatically to manage the light and heat. Government support along with the huge investments in the automobile sector to obtain novel products is boosting the global smart glass market. Rising requirement for eco-friendly as well as energy efficient products is driving the smart glass market. An additional important aspect contributing to an impressive growth of smart glass market is its cost efficiency and minimum maintenance fees. Rising requirement for energy efficient and broad variety of application products is offering a vigorous growth opportunity for smart glass market for the estimated period. Rising technological advancements in this field and the implementation of these enhancements is also one of the reasons for the development of the global smart glass market. For instance, in 2018, Fisker introduced its latest Fisker E-Motion offering an exclusive and pioneering four-segment SPD SmartGlass roof. 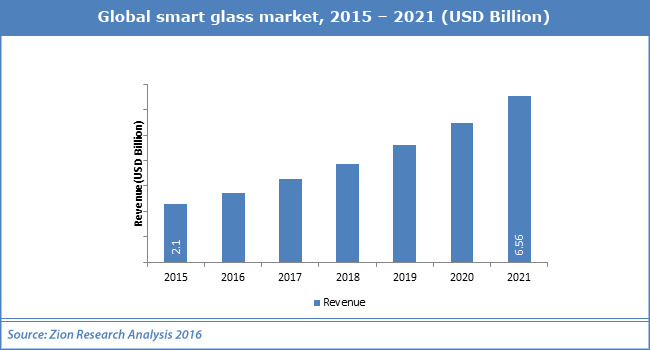 China demonstrates tremendous growth in the smart glass market due to the requirement for high-end technologies as well as the increasing support of the local governments for using energy efficient smart glasses. North America represents itself as the largest market landscape because of high utilization as well as the manufacturing of smart glass. During the forecast period, Europe is supposed to witness a remarkable growth.